After customers are received at the scale house, they are directed to the appropriate receiving area, where their trash is dumped on the facility floor to begin processing. Technicians evaluate the waste and use front-end loaders to push the material to the conveyor belts. After an initial sort from ground crews and excavators, the material is placed on a revolving belt that lifts the material to a second, elevated belt flanked by workers. 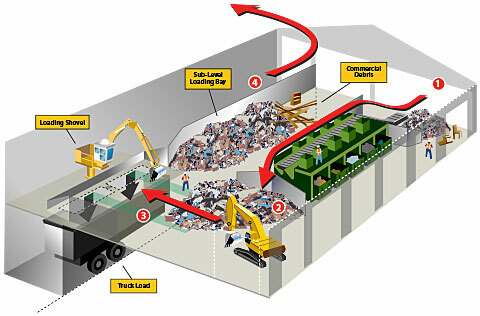 As the material passes by each sorting station, specific recyclables (e.g. wood, metal, cardboard, etc.) 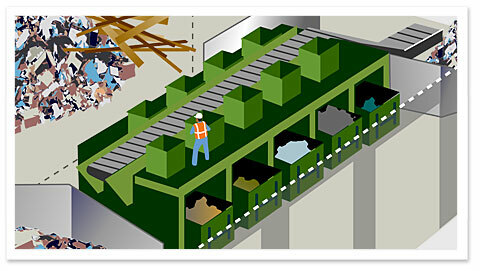 are pulled from the waste stream and dropped into large dumpsters designated for each material type. When the dumpsters are full, roll off trucks remove the material to either be baled or taken “topside” for further processing. The final processing destination for inert material is at our “topside” operation. 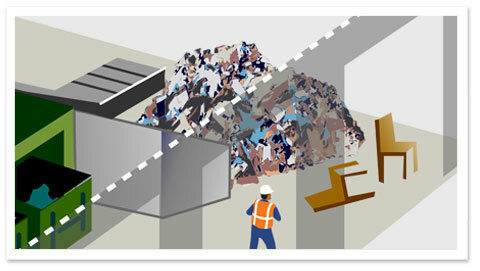 Source-separated loads or material collected at the MRF is assessed for content by a technician upon arrival. Once separated, material is processed for shipment out as a commodity or used on site as base. Commodities we sell include wood chips, pine needles, top soil and fill dirt. Materials used to build working plateaus include asphalt and base rock. 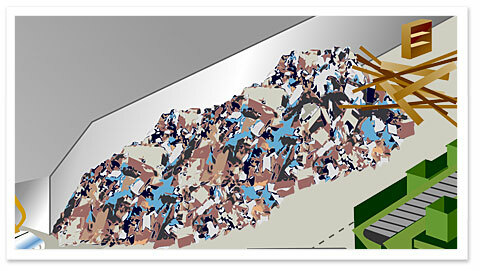 Either method of recovery ensures the material is diverted from landfill. 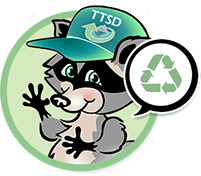 After the sorting process is complete for both residential and commercial garbage, the final residual material is top-loaded into “possum belly” transfer trucks and hauled to a landfill. With the hard work and effort from everyone at Eastern Regional Landfill, the facility boasts a near 50% diversion rate. Our primary goal is to keep as much recyclable and reusable material out of the landfill as possible. Commercial trucks and self-haul customers are directed to dump loads on the floor. Commercial wastes processed average 85 tons per day on an annual work week basis. A loader pushes wastes into a pile where a crane extracts large and heavy items before feeding the balance of the pile onto the conveyor belt. 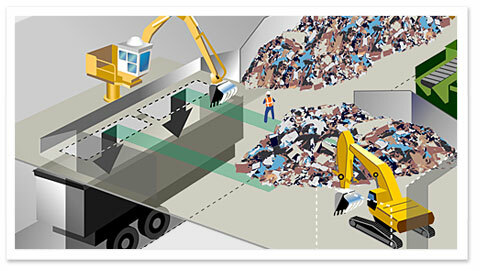 Similar to the residential belt, the commercial conveyor moves the waste between lines of sorters who remove recyclable materials to divert them from the landfill. The commercial line focuses on wood waste, cardboard, scrap metal, plastics, rock and mixed recyclable items. Each category is extracted at a specific station and thrown down a chute into a dumpster. When full, the dumpsters are taken for processing either to the topside area of the facility or to the residential side. Remaining wastes continue on the belt across a shaker unit for removal of fines and onto the floor. A loader pushes the waste into the transfer trailer parked on a scale in a sub-level loading bay. A stationary crane spreads the load evenly within the trailer to distribute weight for safe hauling. Wastes are hauled to Lockwood Landfill for direct burial. Diverted wood is used to make wood chips for sale as a landscaping material or as a fuel for energy. Metal is inspected for freon and mercury removal and then piled, baled and hauled away to be recycled. Pine needles are removed from bags, placed in a pile, sifted to remove dirt and later offered for reuse in erosion control projects.